Games mission: Franciscan Father Stephen Bliss, who is a fleet driver at the Commonwealth Games on the Gold Coast. Photo: Mark Bowling. 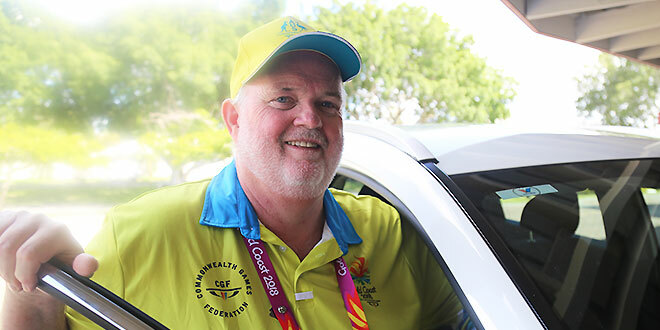 FRANCISCAN Friar Stephen Bliss, an official driver for athletes and officials at the Commonwealth Games, says his passengers are intrigued when they learn a Catholic priest is chauffeuring them. “St Francis said preach the Gospel and if necessary use words. So I think this preaching of the Gospel is about not using words but using a steering wheel,” Fr Bliss said. 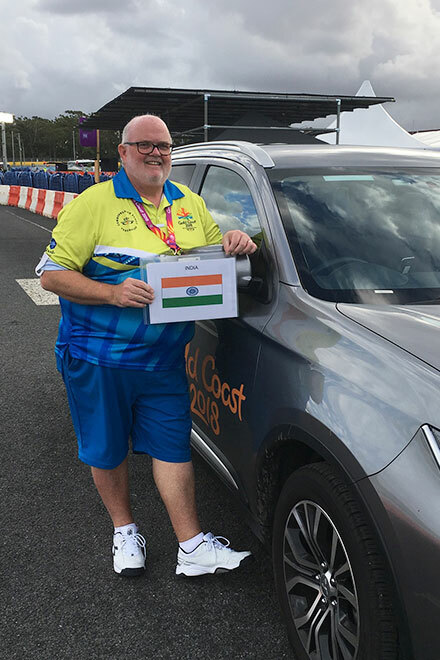 Fr Bliss, parish priest at Ipswich, about 100km inland from the Gold Coast, decided it would be a different expression of his priesthood to sign up as a volunteer fleet driver for the Gold Coast Commonwealth Games. “It’s an attempt to present priesthood in a modern contemporary way and give people here a positive experience, and a different experience of Church,” he said. His Ipswich parishioners gave him their full support when he decided to swap his habit and slip on a Games uniform instead. Fr Bliss has driven visiting teams and officials from the Games village to events all over the Gold Coast. One of his first jobs was to take a busload of athletes from Papua New Guinea on a shopping trip to buy clothes so they could march together in the Games opening ceremony. “We then had to drive to a shop with a sewing machine to do alterations,” Fr Bliss said. He has also transported VIP entourages including visiting ambassadors from across the Commonwealth. “The big thing is being courteous and kind and to me it’s preaching the Gospel in a different way, doing that as a quiet witness,” Fr Bliss said. He said often athletes and officials want to talk as he drives, to get local tips and just to understand a bit about Australia. “And I think they are quite intrigued when they find out I am a Catholic priest,” Fr Bliss said. Driving force: Fr Stephen Bliss waits to pick up athletes from India. Photo: Mark Bowling. Last weekend, he returned to Ipswich, so he could celebrate Mass and then he fronted up for a second week of shifts as a Games driver on the Gold Coast. Fr Bliss said his work was all about being an active and contemporary parish priest. “I try and continue to be relevant to the people of Ipswich. I think we need the parish to see us as human beings, and that the Church is relevant and can adapt,” he said. Fr Bliss joined the Ipswich Catholic community in 2016. He previously ministered in parishes throughout Queensland, Victoria, Tasmania and New South Wales, and also ministered to those in formation (at the seminary) and in administration of the Franciscan Order.